The 3 Points for STRIVE program is a partnership with the Maine Red Claws, Hammond Lumber Company, and STRIVE. 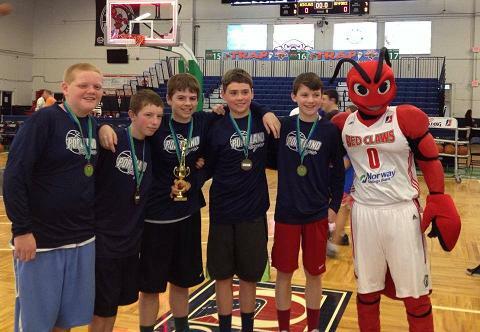 This season-long program begins in November and ends when the Red Claws conclude their season in the spring. Each time the Maine Red Claws score a three-pointer at a home game, Hammond Lumber Company will donate $50. Help grow their donation by making your own pledge! 1. Make a one time donation: Would you rather make a one time donation? If so, send your donation to the STRIVE program any time. Checks can be made out to STRIVE and sent to 28 Foden Road, South Portland, ME 04106. 2. Make a per "3 Point" pledge: For example, if you pledge $.10 per 3 pointer and there are 1,000 total 3 pointers during the season, your total pledge would be $100. You will be invoiced in May, after the Red Claws season is over and the total amount of 3 pointers have been calculated. Download your 2018-19 PLEDGE CARD today! Funds raised by the 3 Points for STRIVE program helps to provide social, educational, and employment training programs for tweens, teens and young adults with developmental disabilities.